When learning to fly, students are introduced to a consequence of Einstein's General Relatively theory - albeit not called by that name. According to Albert, there is no way to experimentally determine the difference between a force caused by positional acceleration and a force caused by gravity. That is, if you did not know better, you could not tell whether the downward force on your body (weight) was due to the 32.2 ft/sec2 acceleration of gravity or whether you were standing in a rocket ship that was accelerating through space at a rate of 32.2 ft/sec2. The phenomenon is responsible for many pilots crashing their airplanes under low or zero visibility condition when, believing they are right-side-up and flying straight and level, they are actually in a coordinated turn or even flying inverted in an arc that generates the same acceleration as gravity. Early fliers, like pioneer airmail pilot Jack Knight had to contend with such dangers not because he was negligent in not outfitting his airplane, but because the instruments had not yet been invented. We all owe our cushy existence to people like Jack who risked their lives to push back the frontiers of ignorance. Outside the tin-roofed hangar and "Operations Shack" at the North Platte, Nebraska air field, a small group of men stood in the chilly, wintry air. Anxiously, they scanned the western sky. Trained ears listened for the roar of a motor. The eastbound mailplane was due at any moment. Pilot Frank Yager had left Cheyenne, Wyoming at 4:59 P.M. They hoped he would be on the ground before darkness completely enveloped the field. Night was closing in fast. So much depended on the hours between now and dawn. The whole future of the Air Mail Service could hang in the balance. This was a crucial test. It was February 22, 1921. That morning, four planes took off at opposite ends of the continent in a race against time and the elements. Their mission: To prove the feasibility of a transcontinental Air Mail Service flying in the face of wintry gales and - for the first time - operating at night over certain segments of the New York-to-San Francisco run only 5 months old. Two of the planes left Hazelhurst Field, Long Island in the pre-dawn hours, westbound for Chicago. With the first light in the eastern sky, the other two planes left from the Marina at San Francisco, eastbound for Salt Lake City. The whole venture was headlined as a bold and desperate move by the out-going Wilson Administration to prove its Air Mail experiment was not a reckless waste of taxpayers' money. Wilson's "Folly" some critics called it. Things had not been going too favorably for the fledging Air Mail, started on May 18, 1918 with army pilots and World War One trainers flying the New York-Philadelphia-Washington inaugural route. Even after the Post Office Department had taken over the operation and extended it coast-to-coast (September 8, 1920) with planes carrying the mail during the daylight hours and the sacks moving on fast trains at night, the service was far below expectations. Wings did not speed the mail much faster than when it moved all the way by rail. In a last minute gamble, the Post Office decided on night flying. It was a day of wooden propellers, strut-and-wire braced, fabric-covered, open-cockpit planes. Pilots flew by-guess and by-God, with a minimum of instruments and gadgets as helpmates. Airborne radio communications were unheard of...a pilot was up there all alone. The lighted airway was only a fanciful flicker in some minds. There weren't any emergency landing fields and airports themselves offered only meager facilities. Nobody knew these circumstances better than the anxious group in North Platte. It included the field manager, the postman who had brought out a sack of mail from the local Post Office, and Captain Jack Knight, veteran of the Cheyenne-Omaha Division, who was waiting to take the mail eastward. Already, there was bad news. The postman had brought it from town. The first westbound plane had developed engine trouble and was down only a short distance from its starting point. Its sister ship was "grounded" at Chicago waiting for the weather to clear. Pilot Lewis, in one of the eastbound ships, had crashed to his death in the high Sierras of Nevada. Yager's ship was the only one left in the sky. And he was running late. Knight went inside the shack and called the local Weather Bureau. When he came out again he was shaking his head. "Weather's getting worse ahead. Snow clouds all along the route. Temperature's dropping..."
The roar of a motor interrupted him. Yager! The next moment they saw his wartime deHaviland (DH-4) one of the famous "Flaming Coffins," converted into a mailplane. Yager had the new landing lights - automobile-type headlights mounted in big cones on the outer struts of the biplane - turned on, their beams pierced the semi-darkness that was settling. He circled the field once, then landed. It was a rough landing which snapped the tail skid. It would have to be repaired. Yager climbed out of the cockpit, looked at Knight with a grin - "You're in luck, son. There's a moon up there above those clouds!" "...and snowstorms over the plains," continued Jack Knight as they went into the shack for hot coffee. It was 10:44 P.M. before Knight got away with the moon. He climbed the ship to 2200 feet and pointed its nose eastward. Roaring through the night sky, ominous, grotesque-shaped clouds swallowed up man and machine - only to release them silently at mysterious intervals for glimpses of the Platte River, a winding, silvery thread below in the moonlight. The river was his friend, Nature's navigator to show him the way. He had other friends, too. At Lexington, Kearney, Grand Island, Columbus and Fremont, public-spirited citizens who knew he was up there, had built bonfires, bon voyage beacons to guide him. The clouds vanished almost entirely. Over Wahoo, Nebraska at midnight, the sky was so clear he could see the lights of Omaha - 40 miles away. Ten miles out, he sighted the field itself, ringed with brightly illuminated red lights marking the landing area. Some 2,000 persons were on hand to cheer the "flying mail-man" as the ship's wheels touched down at 1:10 A.M. Jack Knight's day was done. He had brought the mail through at night. Another pilot would take over. Then, Bob Votaw, field manager at Omaha told him. There was no plane in from Chicago. The flight had been cancelled. No other pilot was available. If the mail went through, Knight would have to fly it. Jack Knight was one of those who had helped pioneer the Air Mail. The 29 year-old Kansas-born flyer, had enlisted in the U.S. Army Air Service in 1917, learned to fly at Ellington Field, Texas, where he became a flight instructor. The war over, he took an engineering job in Chicago, but he couldn't stay out of the sky. His was an airman's world. When the Post Office Department had asked for Air Mail volunteers, Knight joined up. He had started flying the Graveyard Run over the "Hell Stretch" of the Alleghenies, New York-to-Chicago, the first leg of the trans-continental. Then, they transferred him to the Omaha-Cheyenne Division. The North Platte to Omaha segment was his regular run, the main reason they had selected him to take the mail through at night. He knew the route better than anyone else. But the 435 miles to Chicago, across Iowa and parts of Illinois was strange country and darkness would blot out any landmarks. Moreover, he was tired. That same day he had ferried a ship from North Platte to Cheyenne and return. Then he had brought the mail on to Omaha blazing a new trail in the night sky. There was no argument. The honor of the service he loved was at stake. He didn't have to go on. It was his own decision to make. He looked at the sky. The moon was gone. No stars were visible, just the blackness of night. A biting wind whipped him in the face. There was snow ahead. He didn't doubt that for a minute. "Okay," he said to Votaw, "I'll take a crack at it." They went inside the shack. For a time Knight studied the automobile road maps, the only charts available. It wasn't much to go by. He drank several cups of coffee to help him stay awake. Then, he walked out to the plane. One of the roadmaps he tacked onto the instrument board in front of him. "Leave your lights on for an hour," he told Votaw. "If I get lost, I'll come back." With a roar, the plane took off and disappeared into the blackness. It was 1:59 A.M.
His first check-point was Des Moines. He had it circled on the map. A cross-wind blowing didn't help matters. He had to continuously compensate for drift. There was only the compass needle to rely on. He couldn't see anything below. An hour and thirty minutes passed. Then, he saw the lights of a city, a kaleidoscopic glow of colors reflecting on the clouds. He had hit Des Moines "right on the nose." The next point was Iowa City where he'd have to land and take on fuel. His luck was holding, but there was a silent enemy attacking - sleep. He couldn't stay awake. The steady drone of the faithful Liberty motor was like a song of the sky, lulling him into drowsiness. His eyelids closed and it was hard to force them open. Sleep was winning. He clamped the stick between his knees and slapped his face with his hands. He stuck his head far out over the rim of the cockpit letting the chilly blasts of air hit him. Anything to keep his senses. He even prayed for trouble: something to snap him to alertness. If he crashed because something went wrong, or because of the weather - that was one thing - with honor. But if it happened because he fell asleep - that was total disgrace. His prayers were answered. Fog, thick and heavy, grey and coldly deathlike rolled in. Minutes later, it turned to snow. Blinding, stinging, swirling snow; a white dizzy, spinning world all around him. He was wide awake now, fighting the controls to maintain equilibrium. The ship was spinning. Or was it? He couldn't tell whether he was flying right-side-up or upside-down. Suddenly, a terrifying black mass loomed up straight ahead. He was diving. The ground was coming up to smack him out of the sky. He yanked back on the stick, jammed the throttle handle forward. The wheels brushed the tree tops. The ship roared on. There was a new danger. The needle on the gasoline gauge quivered on empty. There was only a few minutes' fuel left. He had already turned on the reserve. Then, he saw something. A brilliant red glare, like a starburst in the night. A signal? It must be the field. He had to gamble that it was. He pointed the ship's nose downward toward the light still glowing. The plane was in a long, flat glide. He saw some trees, then a clear spot ahead. The next instant the wheels touched the ground and the plane rolled to a stop. Knight cut the motor. He heard a shout and there was a man with a lantern running toward him. It was the night watchman at the air field. Knight had landed in the very center of the field. The night watchman explained that he had heard the plane's motor overhead and had lighted a railroad signal flare. Everyone else had gone home! Together, in the snow and cold, they refueled the ship. The snow got worse. Then it stopped almost altogether. Knight got off the ground at 6:30 A.M. There was more fog as he passed over the Mississippi River. But the fog disappeared and there was daylight to help him. The territory below began to look familiar. He didn't even care when the motor started sputtering and coughing again. The terrain was friendly now. He could pick out landmarks he knew from the days when he flew the New York to Chicago run. They were nearing the field at Maywood, Illinois - the Chicago terminus. The plane landed at 8:40 A.M., completing the first night flight of the Air Mail. Minutes later, pilot J.O. 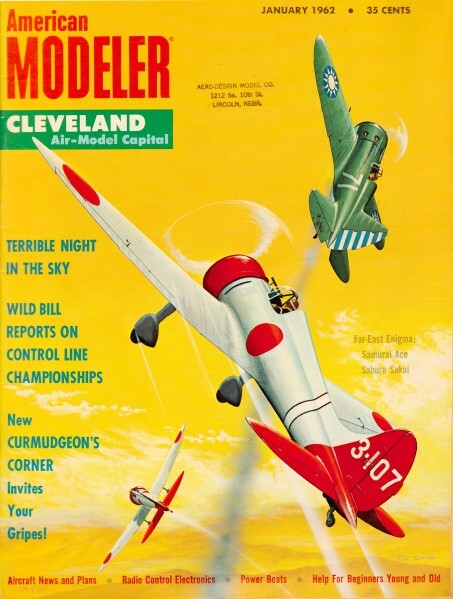 Webster in another plane was speeding eastward to Cleveland. There, pilot E.M. Allison took over and flew the last leg via Bellefonte, Pa., to New York arriving at 4:50 P.M. - 33 hours and 20 minutes after the mail had left San Francisco. It was a new record for carrying the mail, coast-to-coast. The Post Office had proved its point. Less than a week later Congress appropriated $1,250,000 for continuing the service and also set aside more monies for building of a lighted airway across America. Completed in 1925, it gave birth to continuous day-and-night, regularly scheduled transcontinental Air Mail Service. Knight continued flying the mail with the Post Office fliers helping to establish the lighted airway and later with Boeing Air Transport, one of the first of the private air carriers to be granted government mail contracts under the Kelly Act of 1925. When Boeing Air Transport and National Air Transport merged to become United Air Lines in 1927, Captain Jack Knight came along. He didn't quit flying until ten years later, having flown more than 2,400,000 miles and logged 18,000 hours aloft! Still he stayed on with United as Director of Public Education, spreading the cause of aviation, here and there and everywhere, until he died in 1945. His last flight with United, incidentally, took him over a familiar route - North Platte-Omaha-Des Moines-Chicago. Only this time "voices" on the ground were in constant contact by radio, feeding him frequent weather reports and flight instructions. 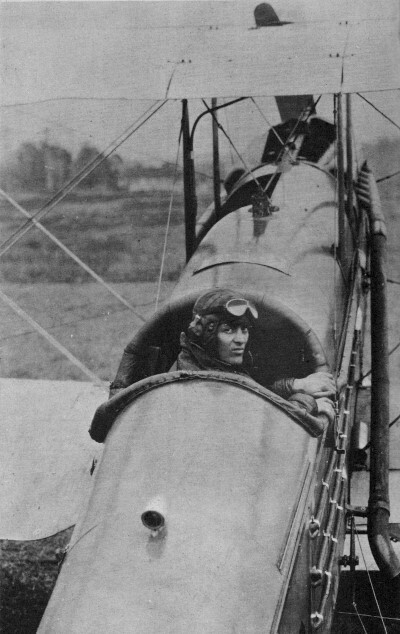 A co-pilot was at his side in the lighted cockpit with its galaxy of instruments. He didn't even have to touch the controls part of the time. The automatic pilot was turned on. There were 21 passengers, some reading, some smoking, others asleep, back in the roomy, warm, sound-proofed, comfortably-furnished cabin of the twin-engine all-metal DC-3 Mainliner. In the cargo compartment was more than a half ton of mail being sped through the night skies at 200 mph. Below, along Jack's route were flashing beacons and brightly illuminated airports. The mail had left San Francisco the night before. The letters would be in New York before noon. 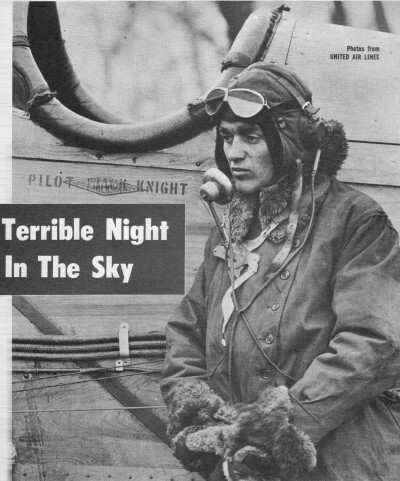 But the flight that made Jack Knight immortal in the annals of aviation was the one he made that night of February 23, 1921. The then Second Assistant Postmaster General, Otto Praeger (generally considered the "Father of the Air Mail") termed it - "the most momentous step in the development of civil aviation."